3Prof. Dr., İstanbul Sultanbeyli Dünya Göz Hastanesi, GÖZ, İstanbul, Türkiye Purpose: To evaluate the short-term visual and anatomic outcomes ofpro re nata (PRN) regimen of Afl ibercept (AFL) without a loading phasein refractory neovascular age-related macular degeneration (n-AMD) with pigment epithelial detachment (PED). Material and Methods: Typical type of n-AMD with PED were only included in this retrospective study. Twenty eyes that met the study criteria were ranibizumab-resistantand switched to pro re nata (PRN) regimen of 2.0 mg afl ibercept. Best corrected visual acuity (BCVA), central macular thickness (CMT), changes in pigment epithelium detachments (PED), presence of intraretinal fl uid (IRF), and presence of subretinal fl uid (SRF) were assessed at 4-8 week intervals. Results: The mean number of prior injection was 13.3±5.1 during a mean of 44 months of follow-up (15-76).The mean duration after switching was 7.2±1.7 months (5-11) with an average number of 2.5±0.8 (2-5) injections. The mean CMT and maximal PED height improved signifi cantly (p<0.001), whereas the mean BCVA remained stable over time. 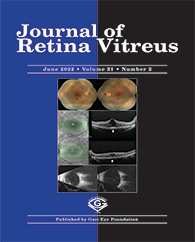 Changes in visual acuity was not associated with reduction in PED height (R²= 0.07, p=0.73). Eighty percent of patients remained visually stable, 10% gained two or more lines, and 10% lost two or more lines of visual acuity after switching. Complete resolution of intraretinal or subretinal fl uid was observed in 75% of the treated eyes.